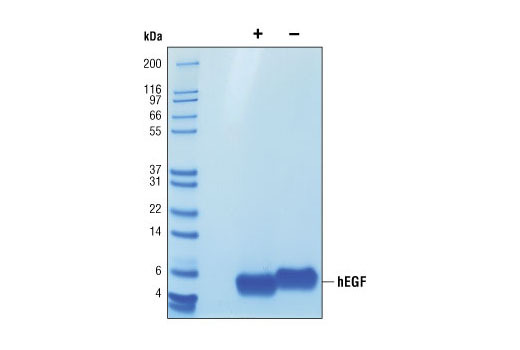 The purity of recombinant hEGF was determined by SDS-PAGE of 6 µg reduced (+) and non-reduced (-) recombinant hEGF and staining overnight with Coomassie Blue. The proliferation of MCF10A cells treated with increasing concentrations of hEGF was assessed. After 24 hr treatment, cells were labeled with BrdU for 4 hr. BrdU incorporation was determined by ELISA and the OD450-OD690 was determined. 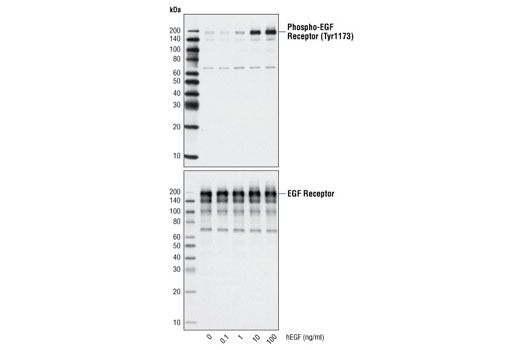 Western blot analysis of extracts from A-431 cells, untreated or treated with hEGF for 10 minutes, using Phospho-EGF Receptor (Tyr1173) (53A5) Rabbit mAb #4407 (upper) and EGF Receptor Antibody #2232 (lower). Recombinant human EGF (hEGF) Asn971-Arg1023 (Accession #NM_0011963) was produced in E. coli at Cell Signaling Technology. >98% as determined by SDS-PAGE of 6 μg reduced (+) and non-reduced (-) recombinant hEGF. All lots are greater than 98% pure. Recombinant hEGF has a Met on the amino terminus and has a calculated MW of 6353. DTT-reduced and non-reduced protein migrate as 6 kDa polypeptides. The expected amino-terminal MNSDS of recombinant hEGF was verified by amino acid sequencing. 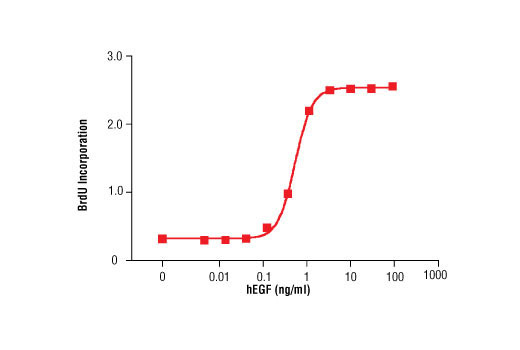 The bioactivity of recombinant hEGF was determined in a MCF10A cell proliferation assay. The ED50 of each lot is between 10-600 pg/ml. Less than 0.01 ng endotoxin/1 μg hEGF. With carrier: Lyophilized from a 0.22 μm filtered solution of PBS, pH 7.2 containing 20 μg BSA per 1 μg hEGF. Carrier free: Lyophilized from a 0.22 μm filtered solution of PBS, pH 7.2. EGF is produced by epithelial cells, fibroblasts and many other cell types (1,2). Low molecular weight soluble EGF is generated through proteolysis of a larger ~130,000 molecular weight transmembrane precursor (1,2). Both soluble and membrane forms of EGF are active (2). EGF induces proliferation, differentiation, and survival of many cell types including tumor-derived cells (1,2, 3). There are multiple members of the EGF family and multiple members of the Erb/Her EGF receptor family. EGF binds to ErbB1/HER1 and induces homodimerization or induces heterodimerization with other Erb/Her members (1). Binding of EGF signals through the MAPK, PI3K/Akt, and STAT 5 pathways (1). EGF, EGF family members, EGF receptors and their signaling pathways are involved in many cancers and are targets for therapeutic intervention (1, 2). Citri, A. and Yarden, Y. (2006) Nat Rev Mol Cell Biol 7, 505-16. Higashiyama, S. et al. (2008) Cancer Sci 99, 214-20. Xian, C.J. (2007) Endocr Rev 28, 284-96. Kovacevic, Z. et al. (2016) J Biol Chem 291, 1029-52. Cursons, J. et al. (2015) Cell Commun Signal 13, 26. Schröder, S. et al. (2013) Mol Cell 52, 314-24. Herr, D.R. et al. (2013) J Biol Chem 288, 29882-9. Tsai, C.Y. et al. (2012) Biochem Pharmacol 84, 1007-13.